From the very beginning, the vision for Pepper Place was to be accessible, inviting and easy to visit and get around. 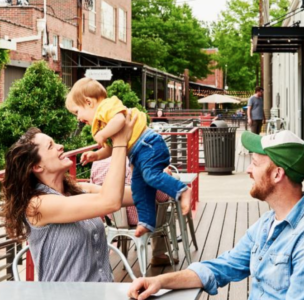 From the types of businesses found here to the events that happen here, from the Market at Pepper Place the new wayfinding, Pepper Place is all about fostering and growing a creative community. A major design feature of Pepper Place is all our outdoor community spaces. They have been developed to provide many places for people to see one another, meet one another, enjoy a break from the office, share a meal, and make a friend. To that end, we are always finding and creating new communal spaces around Pepper Place. Check them out! 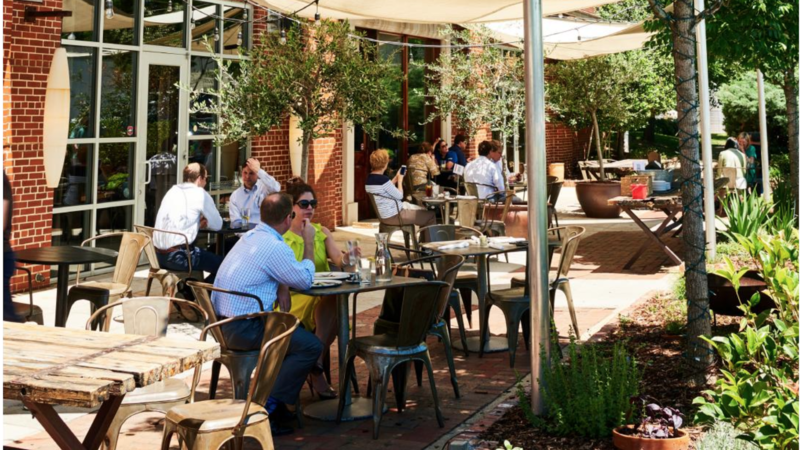 Surrounded by Charlie Thigpen’s topiaries, garden sculptures, and water features, this magical courtyard serves as the outdoor dining area for OvenBird. But, when Chef Hastings isn’t serving up the city’s finest eats, it’s a delightful escape to read a book or catch quick meeting. The gates to this courtyard open at 7 am, making it the perfect place to start your morning. 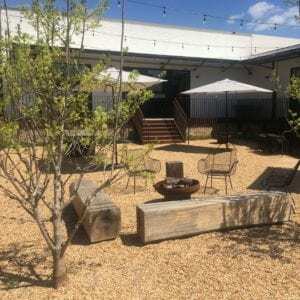 With FarmStand by Stone Hollow serving up irresistible treats, the deck on the side of The Studios building is going to be filling up quick these days. More intimate than the patio but not quite as secluded as the courtyard, the deck is perfect for any number of activities. The porch is the perch outside the entry to the Dr Pepper Building. 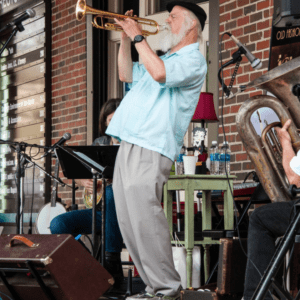 Every weekend during the Farmers Market season, it serves as a stage for a plethora of musical acts and as an impromptu dance floor for our fleet-footed market shoppers. During the week, the porch is a quiet, shady spot to have lunch, an afternoon tea or even to answer emails. Open only when The Lumbar is open is the street-side bar on 29th Street South. 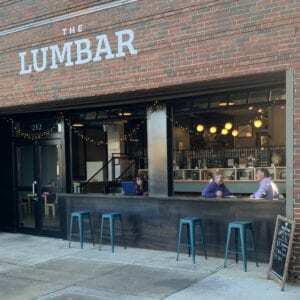 With two garage doors opening to the street, this small bar is perfect for a late afternoon gathering of friends, some smothered tots and a cocktail or two. Got an early morning meeting on a beautiful morning? Need to finish the last few pages of your romance novel before you head back to the office after lunch? Need some birdsong to go along with your latte? 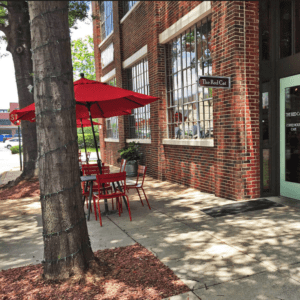 The sidewalk in front of Red Cat is the perfect place for all your sit-down activities. 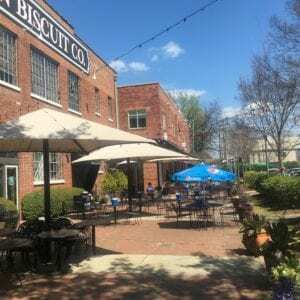 With warmer days finally here, the patio is popping with activity. Diners at Cantina and Bettola keep the activity going from lunch well through after-dinner cocktails, but this centerpiece of outdoor life at Pepper Place is also great for putting on your sunglasses, kicking up your feet, and catching up on your Vitamin D. And soon, it will be home to diners at the new Hot & Hot Fish Club. 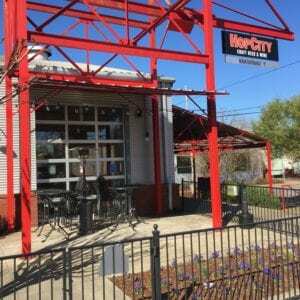 As you move east along the Pedestrian Alleyway, you will happen upon the Hop City patio where you can sample one of their hundreds of brews and enjoy the sweet spring sun. 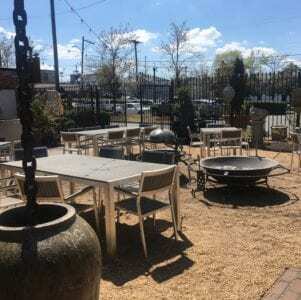 Their weekly tastings make it easy to expand your palette while enjoying the Spring sunshine. Until we expand farther east, the gravel patio at The Blueprint Building is the eastern anchor of our outdoor spaces. At night, you can dine on some of Blueprint on 3rd’s fantastic fare. But, during the day, as our newest space, it offers an out of the way place to study, hold a meeting or simply get some work done.